Last week, the Dail debated the Fiscal Stability Treaty and I told the House that solidarity is the key to recovery. Below is a transcript of my speech. Can we trust the government anymore? I respectfully disagree with the suggestion that criticism of what the Government has done in the past is an entirely separate matter from what we have to deal with now. The two are intimately bound up for two reasons. First, the Minister for Finance and others on the Government side have spent a number of weeks trying to persuade us that the budgetary crisis and the banking crisis are entirely separate. This effort has been made repeatedly in this debate in the past two to three weeks. We have been asked to stop talking about the banks and just talk about the budget when we know that the banking crisis and the central policy failures in regard to banking, and at the top of which failures I would put the blanket guarantee given more than two years ago, are inextricably and intimately bound up with where we are at the moment in regard to the crisis the country is in. We cannot see our way to analysing and debating this issue in any kind of credible way without having regard to these central policy failures, the legacy of which we are facing day in, day out. The second reason we cannot separate the two things is the issue of trust. Can we trust the Government? We can disagree with those in government and that is fine. We all know that we disagree with them but can we trust them or believe what they say? The problem is that trust and legitimacy immediately flow out of any government, leaving aside whether one agrees or disagrees with those in government, if one cannot believe what that government says. One cannot possibly have any trust in that government. The people cannot have trust in a government, some of whose members at the weekend described as fiction that there were ongoing discussions on bailouts or related matters. Another Minister, Deputy Dempsey, who was standing beside the Minister in question shook his head and indicated he did not know anything. Either the Ministers knew what the position was and misrepresented it or they did not know what it was, in which case what are they doing in the Government? What is going on in the Government in relation to policy? My brothers who live in the United States are as well informed about what appears to be taking place as are the people here who are being informed by the Government. This morning’s interview by the Minister for Finance hit rock bottom in that respect. There is no frankness or honesty, without which one cannot have trust and-or legitimacy. In seeking consensus on a particular course of action one would have to know the proposed course of action before answering the question as to whether one agreed with it. That is a first principle. For example, if consensus is being sought on a four-year plan, we will have to see the plan before we can decide whether we agree with it. Is that not straightforward? Anyone can see that that is agreeable. From the brief reports I have heard on the meetings which took place with the Commissioner this morning, I do not know whether matters have changed specifically. However, there appears to be less certainty about the figure of €15 billion in the four-year adjustment period. The three main parties are agreed on the need to make an adjustment in order that we can get to the figure of 3% by 2014. There should be no question about that target, but what will it actually mean? We know that up to three weeks ago the Government believed the adjustment figure would be €7.5 billion which quickly became €15 billion. Three scenarios were presented by the Government for the budget to be announced in December. On 22 October The Irish Times reported Government sources as saying the Department of Finance was seeking an adjustment of €4.5 billion. Only two and a half weeks ago the figure was €4.5 billion, it is now €6 billion. Anyone may look to the Opposition for consensus or certainty, but we must look to the Government in the first place for a sense of what is going to happen. I agree and accept that the situation is fluid. The Government must examine the growth predictions for next year and where we will be this time next year with the unemployment figures and so on. I accept that matters are in a state of flux, but Senators on the other side of the House should not demand certainty from the Opposition, a demand they do not make of the Government. This is simply not logical. It is the principal objective of the Government to prepare a budget, present and have it passed by the Dáil. There is a lot of talk about whether the Opposition parties will help to get the Government over the line. The Government must get the budget over the line. If it cannot do so, it will lose not just the confidence of the people, it will also lose the confidence of Parliament and have to go. That is the way our democratic system works. It does not mean, however, that we are against adopting a co-operative approach. We will do everything we can, for example, concerning the adjustment to be made in the budget. The Labour Party will come forward not just with a clear and specific set of objectives, it will also show how they can be achieved. When we talk about consensus, let us be clear about what we mean. Let it be understood that, in the first instance, this is the job of the Government. Some two weeks ago when the Euro loan facility was first introduced, it was suggested it was a godsend that the Government could lend to Greece at a higher rate than the rate it would have to borrow the money. I was glad this argument did not feature in the Dáil. I was beginning to wonder if that were the case, why were we not borrowing money from the international markets to lend to countries in difficulty all the time and, accordingly, solving many of our own problems. I am glad this argument was abandoned, as no one in his or her right mind would argue this is some process in which we want to be involved. This loan facility is about showing solidarity among members of the eurozone. It is not the solidarity we had in mind when we joined the euro or the European Union. None of us expected solidarity would require us to dig deep in our own pockets for others. However, that is what has occurred. This solidarity is predicated mainly on a sense of “There but for the grace of God go we”. There is a certain vested interest in this solidarity, as we might face the same fate as the Greeks in the future. This so-called bailout for Greece could be transformative for the entire eurozone. However, we should rise above that particular level of discussion and argument, true and all as it may be, and start to contemplate and consider the real transformation this will likely bring, ultimately, to the whole nature of the European project, to the eurozone and to the mechanisms that have been deployed to date through the Stability and Growth Pact and elsewhere. It appears as if the Stability and Growth Pact is finished as a real mechanism or as a mechanism with credibility in any sense or one which can be restored to any level of credibility. A more complex set of measures must be agreed and imposed throughout the eurozone to achieve the type of convergence and economic co-operation or cohabitation among different economies within what is, essentially, a single currency, but also a unified economic system. There is no doubt that the mechanisms put in place at the beginning have been found wanting and that they appear to have collapsed. A meeting tomorrow of the ECOFIN Ministers takes place today to examine the implications for the future of what has occurred and to begin to ask questions about what new mechanisms should be put in place. This must be considered. It should lead to a broader political debate in this country as well regarding what we can expect in future. Last week, there was a skirmish about sovereignty. People got very excited on the Government side at the point made by the leader of the Fine Gael Party to the effect that there was a threat to Irish sovereignty in respect of several instruments such as corporation tax. We must see beyond a reactive debate when someone makes such a remark. We must all understand there is no question but that the character of the relationship between an individual country and the eurozone will change and there will be a great political battle about this in the coming years. I listened carefully to the speakers on the government side who started their speeches by telling us how they are satisfied or pleased that matters are starting to turn around and the position is changing. The phrase from the Minister for Finance, Deputy Brian Lenihan, in the budget was that we were “turning the corner”. All these phrases are used. I waited to hear examples of concrete achievement. The claim is that action is beginning to bear fruit but no example is ever given. The only instance I have heard repeated is what the Minister for Finance said on radio yesterday morning about the people who Richie Boucher met when he went to Europe last week being very happy with us. The people Mr. Boucher had dinner with in Europe, or wherever he was, appear to be happy, and the Minister for Finance said he was perplexed that everybody abroad seemed to be happy but nobody in Ireland is happy. That is because the people in Ireland are facing the brunt of what is occurring. The Minister has spoken about finance ministers and other colleagues in European governments being supportive of what the Irish Government is doing. Forgive me if I am wrong but I do not think I have ever seen a minister in the European Union criticising a colleague from another country. What is this business about with people getting a pat on their back when they go abroad? They seem to think that is the approval rating needed. Of course, there is only one approval test and set of criteria by which we can meaningfully assess anything the Government is doing. That is the kind of delivery that some of the government speakers, when they come to their senses, would apply to the debate; it concerns when there will be real lending available to businesses and people in the Irish economy. There is no evidence that it has happened yet. I am sure if the Minister could find a morsel of evidence for it he would tell us about it all the time. There is no evidence. I want to respond to some of the Minister of State’s comments. It is almost laughable for him to come to this House speaking about the “honest and full disclosure by the Government and its agencies of the appalling mess within our banks”. I cannot believe the term “honest and full disclosure by the Government”. I did not know whether to laugh or cry when I heard him saying that. What disclosure has occurred, whether honest or full? The Report of the Sub-Committee on Ireland’s Future in European Union provides and interesting and timely opportunity for us to revisit the issues we have previously discussed in the House. Like others, I do not want to repeat all the arguments in which we have engaged on the various occasions we have discussed the Lisbon treaty. I welcome the report and congratulate Senator Pascal Donohoe on this extremely detailed and readable document. It begins by placing this debate and the moment we are at in true terms. We cannot shirk from those terms, as they point to a choice that must be made by the Irish that is of enormous importance. It cannot be shirked by people on either side of the argument. Those of us who supported the “Yes” vote did not do so on the basis that we would not have liked to change some elements of the treaty. Anybody engaged in a political activity knows that an international treaty involving 27 governments will require compromise and elements that are not liked. Those of us who argued for a “Yes” vote now have a choice as to how and in what circumstances we might revisit the question. It is a difficult choice because we know and respect the decision of the Irish people, which is the right action. Is it being suggested that we let the issue go? Those on the “No” side also have a choice to make, as I have repeatedly heard people almost pleading that they are as European as the next person. They believe in a strong Europe with Ireland at its heart but they do not like the treaty. It is incumbent on all of us, including those who argued and voted against the treaty, to come forward not just with repetition and a rehashing of those aspects of the treaty they do not like but to help us point the way. The people should advocate how we can ensure that we are at the heart of Europe in future, particularly through a method other than what I term ‘Lisbon Plus’. There should be some genuine accommodation of the obvious concerns that many Irish people have and had with the Lisbon treaty. Ireland’s standing and influence in the European Union have diminished following the people’s decision not to ratify the Lisbon Treaty. In immediate terms, this inhibits Ireland’s ability to promote and defend its national interests at a European level. This is likely to affect Ireland’s ability to influence key upcoming policy discussions within the Union. These include, but are not limited to, the development of the EU’s climate change package [by which we mean the future of the planet and our ability to influence it through being involved in discussions]; the negotiations on the future shape of the EU budget beyond 2013 including provision of adequate resources for the Common Agricultural Policy; and responses to the global financial crisis. I disagree profoundly with the position of the President of the Czech Republic in relation to the European Union but an issue arises in respect of the maturity of the debate we have. If the President of the Czech Republic states his position in Ireland, surely the way to counter that is through the strength of the arguments against what he is saying rather than suggesting he does not have the right to speak. It has been suggested that it is outrageous that a foreign leader should come to Ireland and make such points. It is not deemed outrageous, however, if foreign leaders who hold the opposite view come here and make their case. I disagree with the position taken by the President but we have more strength in us to deal with these arguments than to simply suggest that every time somebody such as Mr. Klaus opens his mouth, it constitutes interference in our process. The lesson of the Lisbon treaty debate, be it in the media or the political fora, is that those in favour of the treaty missed the opportunity to demonstrate a much more robust and self-confident approach and instead often seemed to want to exclude views with which they disagreed. It is not a matter of discretion or opinion as to whether the view of the Irish people should be respected or accepted, it is a constitutional imperative that it be so. I regard it as almost something that goes without saying, but I will say it just in case there is any doubt. Of course, one must respect and accept the result of the referendum last week. If it requires to be said, I am happy to do so. It does not end there because there is no question that the Lisbon treaty is finished and is dead in the eyes of the Irish people. The treaty that was put to them last week is dead, but by voting as we did we have not necessarily rendered it dead in the eyes of our European partners. While we cannot ratify it that does not mean that our decision does not have implications and consequences throughout Europe and with our partners in Europe. We can feel good about the fact that the treaty is finished and is dead in our eyes but we cannot make it finished and dead in the eyes of others. These are the consequences we and the Government, in particular, have to face. I do not underestimate the task and the seriousness and the depth of the challenge that faces the Government in the context of the economic challenges to which Senators Fitzgerald and O’Toole have referred. I am glad we have ordered an initial debate this afternoon on this issue. I support that call. Sometimes eyes glaze over when this point is made but it is important to make it at this juncture. What is the nature of the debate we need to have? It cannot be just a squabble over who did what when, where there were posters and where there were none, who was out on the street and who was not. By all means, let us have that debate if people feel it is necessary but a much more fundamental debate is needed which has to do with the question of trust in democratic institutions and trust in the very practice of politics in this country. By that I do not mean I am frustrated that the people would not do what the politicians suggested they do. Senator de Búrca made the point in the newspapers at some stage during the campaign that it must be asked why, in such serious issues, we should expect people to handle a complex issue presented to them for decision four weeks before a referendum, in circumstances where we do not have a real continuing debate about these issues. We have such debates here but we do not have them in the community. That is the level at which the debate has to be had. The question of trust and the question of democratic institutions are all bound up in the result last week. Some of the innovations contained in the Broadcasting Bill might assist in that regard. There should be a public forum on television and in the media where people can have an opportunity to tease out these issues in great detail rather than simply presenting them with a complex document a few weeks before the referendum. As Senator Fitzgerald and others have said it will be difficult, although necessary, to analyse the reasons people voted “No”. In many cases they are directly contradictory. There are people who thought the charter of fundamental rights did not go far enough and there are those who thought we should not have it. There are directly conflicting views. It is all very well for people to come forward with a wish list, whether it is Sinn Féin, Libertas or anybody else. I have a wish list. We can all have one. The question is whether we can deliver it. By all means, let us have a debate about the aftermath but let us have a more fundamental debate about what it means and how we can improve the quality of our public discourse on issues such as this. The Seanad will discuss the outcome of the Lisbon Treaty referendum this afternoon. It’s the final day of canvassing on my part in Dublin South. Over the past number of nights my team and I have been knocking on doors in Rathfarnham, Knocklyon and Ballyboden and I have to say that generally we have had a very positive response. Tomorrow we go to the polls, and I sincerely hope that there will be a high turnout – and that is something that both the Yes and No side agree on. I urge anyone who has the opportunity to vote. Polling stations will be open from 7am tomorrow morning and will stay open until 10pm that evening. Remember to bring your voting card and some sort of identification. I have had some concerned residents say that they had not received their polling card at the beginning of this week. If this is still the case, check you are on the register by clicking here and if you are then bring identification (driving licence, passport, etc.) to your local polling station. I sincerely hope that people will fully consider what is at stake in this referendum, and I believe that the above advertisement (carried in some national newspapers this morning) should drive home the reasons to vote Yes tomorrow. Those campaigning for a No vote have said that this Treaty can be easily sent back to be renegotiated. This is a totally naive position. This Treaty which we vote on tomorrow is the culmination of hours, months, years of hard work by all 27 states in the EU, at some stages chaired by Ireland. If we were to ‘send it back’ there is no guarantee that we will get a better deal. In fact, we may become worse off. A Yes vote will mean that Ireland will continue to be an equal in the democratic process of the European Union. It will increase the say of the Oireachtas. It will enshrine workers rights. It will help protect trafficked women and children. It will promote public services. It will make the EU work more efficiently. A vote No is a vote for the unknown. Right now, for Ireland and for Europe, in this current economic climate, it is not a time for a step into the unknown, and as party leader Eamon Gilmore said, not the time to ‘throw a wobbly’. During canvassing for a Yes vote in Dublin South, I have heard some people say that they are considering voting no in Thursday’s referendum because they do not wish to see the powers of the Oireachtas ‘handed over to Brussels’. As a senator, I must respectfully disagree with this claim. 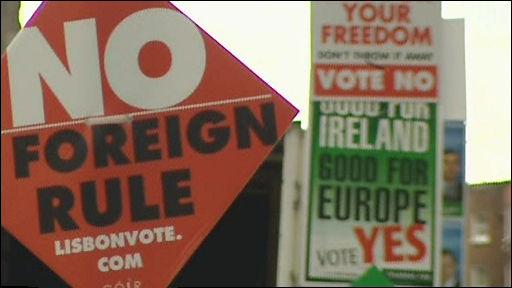 Of the 60 Senators, I know of only four who are advocating a No vote, and in the Dáil, all the major political parties bar one are in favour of the Lisbon Treaty. The reasons for this outlook are simple. While there are many reasons to vote Yes on Thursday, as a legislator, I must put forward two reasons on why the Treaty will actually provide more power to the Oireachtas, contrary to what many on the No side believe. For the first time, the Oireachtas will have the powers to examine proposed legislation coming from the EU. If TDs and Senators have objections to that legislation, they can raise their concerns and have the legislation re-examined. Yet, if Ireland still feels that proposed legislation is contrary to our interests, it can be struck down with the support of a majority of our EU colleagues. As I pointed out yesterday, the majority of what comes from the EU is technical and more important issues such as justice and home affairs are not dealt with in this way. This is the first time that national parliaments have the opportunity to fully examine the legislation produced by the EU. It is something the Labour party have sought for some time and it can only lead to an enhancement of democracy in the European Union. Furthermore, the Treaty for the first time allows citizens to get involved in the inner workings of the Union. Where one million European citizens petition the European Parliament regarding a particular subject, it is the duty of the EU to respond. This is a significant step forward towards opening the European Union up to citizens. I have no doubt that this ‘Citizens Initiative’ will lead to further initiatives in the policy-making process. While these are just two reasons to vote Yes on Thursday, any suggestion that the Lisbon Treaty will erode Irish democracy should be rejected. If the Treaty is passed, the EU will be more accountable to the Oireachtas and to the citizens of Europe. That can only be a good thing. Vote Yes on Thursday.